Deep End Dining's "Celebrating Manhattan" Giveaway. Radio Room @ The Edison. 3 Master Mixologists from Manhattan in LA for 1 Night. CLOSED. Heaven is a place on 2nd St. 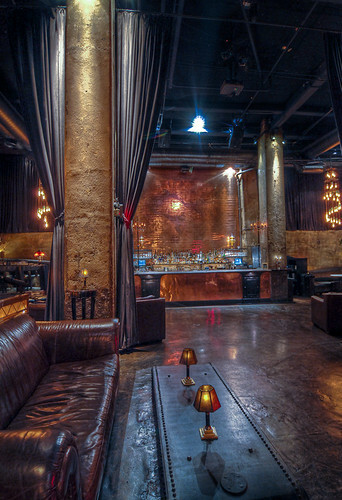 If I were to design the bar slash ultra lounge of my dreams, I would simply highlight The Edison in Downtown Los Angeles and press (apple) C. In other words, just copy it. Why sweat it when the perfect place already exists? Of course I'd change the location so that it somehow squeezes into my house. Part Dr. Frankenfunk's laboratory, steampunk palace, gothic playground, homage to art deco, intersection of the past and the future, and the ultimate in stylish debauchery all linked in hand holding harmony, there is nothing else like The Edison. And did I mention they serve killer cocktails, the kind your grandfather used to quaff when he was younger than you. Stuff made with classic spirits like Single Malt Scotch because everything old is cool again. Ward III (not just I or II), the much lauded tavern in Tribeca, has loaned 3 of its star bartenders, Michael Neff, Kenneth McCoy and Abdul Tabini, to Radio Room at The Edison. Let them help you get your Edis-ON!! The old school musical stylings of Paulie Cerra and his Jazz Orchestra will transport you from this era to another. The perfect spot, the best bartenders and all that jazz. It doesn't get any better than this. Wait, yes it does! How about skipping out on the cover charge and getting in free with 3 complimentary drink tickets good for cocktails from the 3 magnificent Manhattan mixmasters (a drink from each!). It all happens on Tuesday, July 13th starting at 8pm! YOU CAN ONLY ENTER ONCE. 4 WINNERS WILL BE SELECTED AND ENTRIES WILL BE ACCEPTED UNTIL MONDAY, JULY 12, 2010, 5PM PACIFIC. So tell me what your favorite New York drink or New York thing is and I'll randomly select the lucky Joes or Josephines who'll get to Celebrate Manhattan in the Radio Room at The Edison for free! Good luck! Even if you don't get the freebies this time, it is still a must do on Tuesday, July 13th at 8pm only at The Edison's Radio Room! 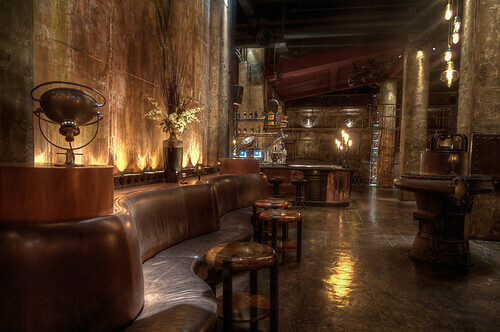 "Ward III...is a bar without equal in New York City. One that, quite honestly, deserves even more praise than it’s attracted." Bar of the Week ...”any libation your imagination can conjure." "Ward III's bartenders excel at creating bespoke drinks based on whatever suits your mood." "Ward III is something remarkable, something ingenious and kinda mind-blowing all at the same time." "...fix me that drink from that time with that stuff." "These guys know how to make a drink..."
CONTEST RULES: YOU CAN ONLY ENTER ONCE. 4 WINNERS WILL BE SELECTED AND ENTRIES WILL BE ACCEPTED UNTIL MONDAY, JULY 12, 2010, 5PM PACIFIC. GOOD LUCK & THANKS! You are welcome! It's one of a kind for sure!